Wright of Passage - Changing Lives! SWD are Excited to offer this Fully Funded Youth Opportunity! For those seeking an alternate pathway to their future. A youth opportunity to learn in a hands on way, while opening doors for the future. 3) wants the opportunity to start a TRADE, open doors to employment and at the same time experience a trip of a life time. Round 1 participants of this exciting program are proof that being offered the opportunity to learn in a different way, while also being mentored brings about life changing opportunity and new found confidence. Feedback from the students themselves has been very positive, gaining skills and proving to themselves that they 'can'! It is also heartwarming to hear comments from home about the confidence gained and the excitement about the future that has been obvious since beginning the course. Round 2 intake is open now and will be on going! We encourage any youth fitting the above criteria to contact us! The program is free and consideration for assistance with travel expenses will also be made on a case by case basis. Targeted at youth aged between 16-25yrs who have disconnected from school and are seeking an opportunity to learn in a hands on way while being supported by mentors. 'Wright of Passage' is a unique opportunity to become involved in an inspirational, life changing project, that can allow progress into various trade apprenticeships, by learning about tools, and gaining joinery and woodworking skills. Do you know someone who would benefit from this life changing opportunity? This unique project has come about due to the donation of a timber 53ft Herreshoff ketch. While this boat is principally sound, it needs some work to be seaworthy. This work entails many trade and professional skills to bring it up to a satisfactory standard. For the next six months the boat will continue to be refurbished at the historic Woolwich Dock, in the heart of the harbour and local boating industry. Teams of youth undertaking the 'Wright of Passage' Program and with the mentoring support of the trades on site will be responsible for the refurbishment. 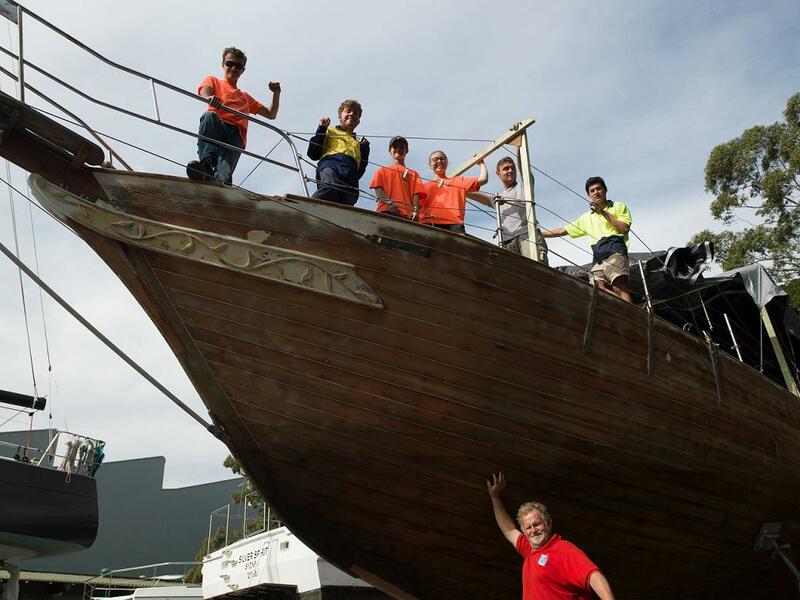 In November 2018 sea trials will commence, and program participants will begin preparing their boat to sail to Hobart for entry into the Wooden Boat Festival 8-11 February 2019. The boat will be crewed by the participants of the 'Wright of Passage' Project, who have worked on the program since the beginning under the supervision of a management team. It will then be used for our Winds of Joy Programs in Hobart and return to Sydney for Stage 3 and 4 of the restoration. This program is FULLY funded (ie, Free!). Registrations now and one of our program coordinators will be in touch to assist you! Orientations will welcome you to the program and ensure that you are fully informed. Participants will undertake three days on site at Woolwich Dock.